Special Purpose Blow Guns by Amflo offer optional special purpose accessories to meet your exacting needs. 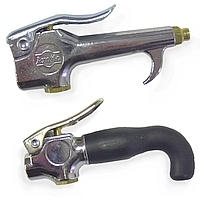 Special purpose blow guns and accessories found on Fluidline Catalog page 079 are not OSHA safety devices. However, for Model 200 & 201 Blow Gun, use any of the 204-E* safety extension tips (See 212 Accessories) found on Fluidline Catalog Page # 078 , and they become safety blow guns.